Introduction: In previous articles i explained how to Fill checkboxlist based on dropdownlist selection and Fill cascading dropdownlist i.e. 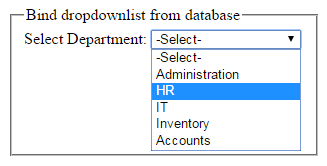 Country,State,Cities in the dropdownlist and Validate dropdownlist using jQuery and How to open Pop up window on Drop down selection in Asp.net and How to fill dropdownlist with days, month and year and Fill ListBox and RadioButtonList and CheckBoxList from database in asp.net. am new to asp.net,and I want to use a dropdown list bind the data from backend for example,I have 4 columns in back end emp id,emp name,city,sal.I will choose datatext field is emp id I will bind it to my dropdown list after selecting emp no I want show related data in below labels or gridview how to do this one please help me. Hello..I am creating article as per your requirement.Please check by tomorrow morning..
Hi sir i am new to asp.net and i want to store data in sql server2008 with c# and i want to store data using radiobutton, dropdownlist,Please help me. and please more clarify your exact requirement so that i can create a article resolving your problem..
That was simple and beautiful. Thank you for taking the time to help us out. it is always nice to hear that my posts helped anyone..thanks Peter Campbell for appreciating my work..stay tuned and stay connected for more useful updates..
your welcome manyu.i am glad to know that my post helped you. Keep reading and stay connected for more useful updates..